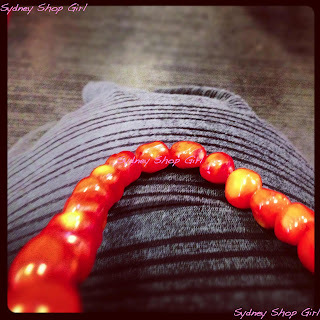 Sydney Shop Girl: Goodbye Feet, Goodbye Makeup. Good Makeup Buys. It's been nice while it lasted and I look forward to seeing you again soon. I know you're still there, doing what you have to do so it won't be a case of out of sight and out of mind. There's been a lot of goodbyes (and good buys for that matter) these last couple of weeks. Last week saw me lose three items of makeup. One by natural causes (the Clarins highlighter / under eye concealer pen) and two through misadventures involving polished wooden floor boards. I could have been reckless and ordered replacements from Strawberrynet or even waltzed into Mecca Cosmetica but I decided to challenge myself to see what I could do with around $50 at Priceline. 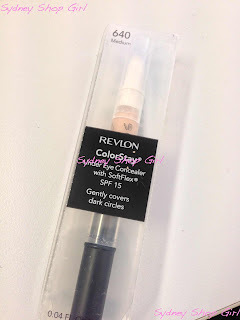 To replace my Clarins pen, I decided on the Revlon Colourstay Undereye Concealer. I am a big fan of the original Colourstay Concealer which has a thick but easy to blend texture, wore well through the day without creasing and generally did what it had to do without any dramas. There are 3 shades for each product and I bought Medium which is the darkest. in terms of level of coverage, I'd rate this as medium to high. My panda eyes went into hiding today, even under flourescent light and out in the mid day sun. reasonably priced for the performance and quality of the product. if you prefer a more liquid concealer or are a compact fan, the intermediate consistency of this product may take some getting used to. With around $20 left in my makeup budget, I had to get creative with how I was going to buy both a blush and higlighter at this price. True to form, I went over budget but not by as much as I could have. Models Prefer is an in house brand for Priceline and most, if not all of their makeup costs under $10. I've been using the pencil eyeliners for most of this year and have been impressed with the colour range, how soft they are and their lasting power. There are two colour options for their blush and highlighter compacts. So as not to look too obsessed, I managed to leave one blush behind and only bought the pink toned blush and both the highlighters. I was hoping to be able to demonstrate colour swatches on my arm but I couldn't get them to photograph well so verbal descriptions will just have to do. 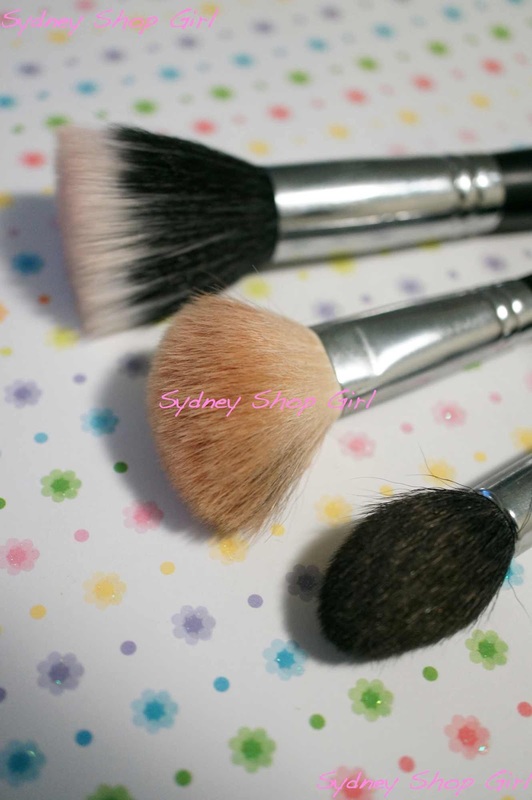 they do not come with brushes. very highly pigmented so a little goes a long way, using one of those flat top, stippled brushes seems to counteract this problem. Sigma brushes that work with Models Prefer blushes and highlighters, for me, at least. From top to bottom - SS187, SS168 and F35. Available online from the US via the Sigma website. 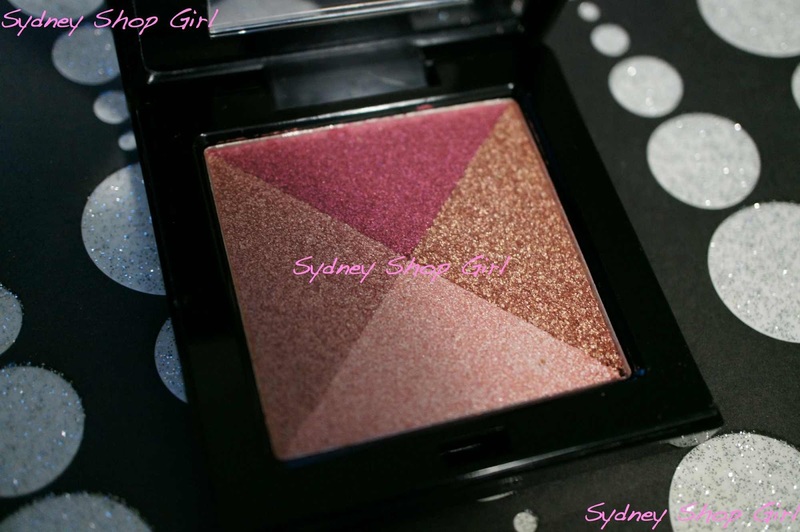 The two colourways available are Fame & Fortune (bronze, gold, ivory) and Glitz & Glamour (rose, pink, rose gold). My logic for buying both is that at the price, I could use them together if neither was working on their own or even with the blush if that failed me too. I am loathe to buy another Shimmerbrick. It was painful having to ditch $90 worth of makeup simply because it had broken too many times to be of any use. 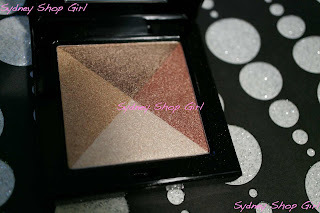 Fame & Fortune with its more neutral tones worked well over eyelids and the brow bone. 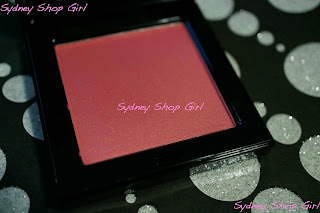 like the blushes, best applied with a light hand because the shimmer can turn to an early eighties frosty otherwise. The Iconic were true to their word. My Holster jelly sandals arrived early this morning. With their in house magazine and a coupon for $15 off my next purchase. I'll read anything with Nicole Richie on the cover! This is a more accurate photo of the colour of my new jelly sandals. The colour is a pewter grey and yes, it works with both my Camillas!!!!! I found Holster to be true to size and the sandals fit well without being too loose around the ankle like some flat sandals can be (Country Road seems to do this all the time). Don't forget that Life at 7 is starting tonight. I'm a long time fan, right from the first season. Despite there being a series only every 2 years, I seem to have a photographic memory of the families and the youngsters. Oh and, keep the faith, readers.... tomorrow is .... HUMP DAY!!!!!!! Let's hope this sunny weather lasts the distance as well. I've got plans for a lovely weekend and I don't want those plans rained on. Love that show! Thanks for reminding me. Bump is looking great. Farmgirl and I are both holster fans. They do good foot bling! She rocks the pink versions and I go for the clear or the pewter (and one memorable Christmas the embedded glitter). Exciting re loss of foot vision ! Those jelly sandals are seriously pretty! 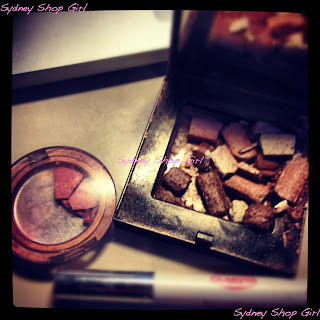 Great beauty finds! I often think that some of the expensive brands are over hyped. Nearly every expensive mascara will leave me with an allergic reaction, good old covergirl in the pink and green tube is perfect every time. 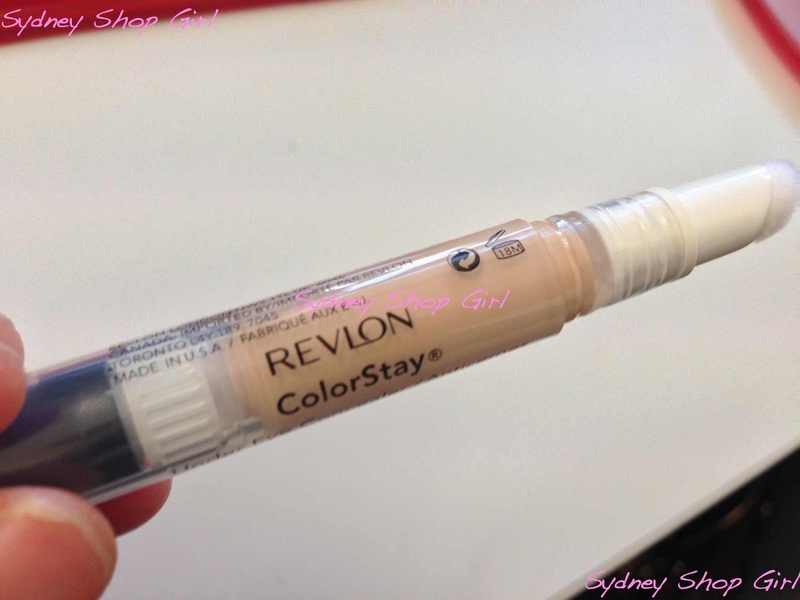 Revoln make such excellent (and well priced) lipstick and nail polish I can't go past them. 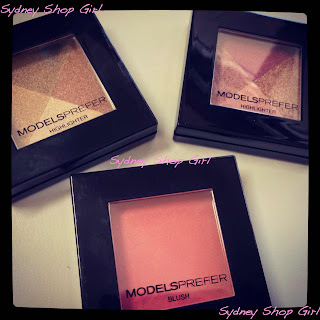 I've never tried models prefer but will give it a look next time I'm in Priceline. Jelly of the jelly sandals. Love! I'm a new Iconic addict too, Carly. Had no idea how wide their range was. It's too easy. Revlon as served me well with nail polish and lip colours too. I get bored easily so it's hard to justify the high end prices. You need a pair, N!! That's endorsement, if the Farm girls are fans too! Can't wait for summer.